Although the BitTorrent network is one of the quickest and most popular that exist, it suffers from the lack of organization of having an integrated search engine in the clients. In general, each user has to search for the torrent files that he/she wants to download. 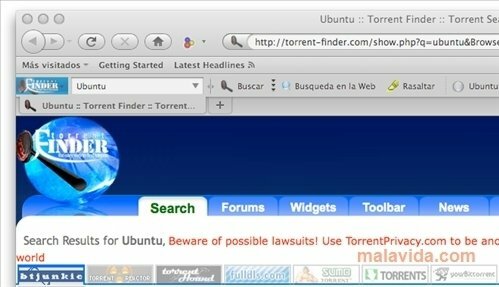 Now, with Torrent Finder, they will be able to search for torrents directly from Firefox. 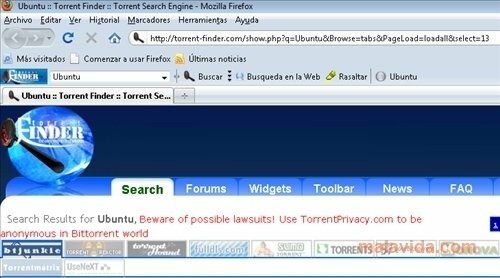 This Firefox add-on installs a toolbar that bases all its functions on scanning the most popular download websites like The Pirate Bay or TorrentReactor each time that we input a search, showing the results of each website so that we can easily find what we're looking for. Once the search has been performed, we can change between more than ten different torrent search engines to find the one that we want. Torrent Finder also adds to the toolbar the function to highlight the text that we have searched for in the result page and save all the searches so that we can take them into account later.